statements are true. 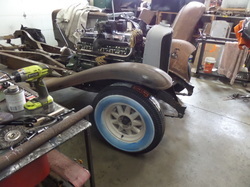 Follow along to see how I rebuilt the "DELCO" shocks for my Auburn. 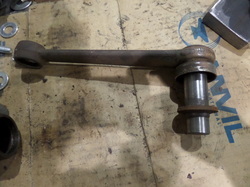 This not a step by step tutorial, but I hope to show that there is not any type of mystery of how these work.Originally the shocks had a leather seal on a tapered bore jammed against the shaft under the metal cover.The leather when oil soaked would swell against the shaft forming a seal.When not in use the leather would dry out, shrink, and leak. I set the shock body up in a mill, used an offset boring head, and machined for the new seal. 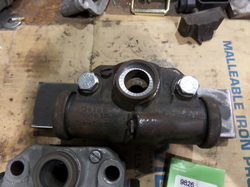 (ignore the chatter marks) I simply bolted the shock body to a piece of 1/2" plate for this.The seal that I used was from NAPA, the number is 9826. Around $5 each. 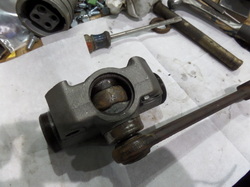 This shows the center 'toggle' piece that works against the cylinder (lower left) it is internally splined and driven by the lever arm. The photo does not show the splines very well. These two pieces have a pretty tight press fit. 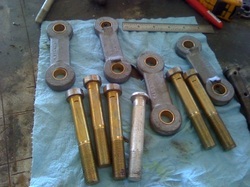 These are the original rear spring shackles. 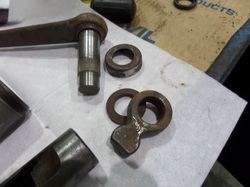 I installed bushings and made new bolts as the old ones were quite worn. 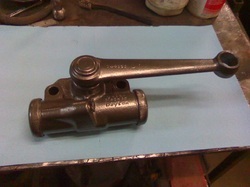 Here is the lever arm. 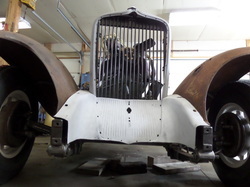 The arm and shaft are welded together. You need a press to push this out of the shock body. you can see the stock leather 'seal' and the protective metal cover. You can NOT see the new seal when finished. New seal pressed in place. 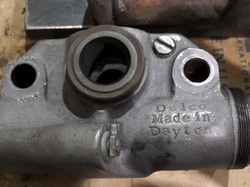 The Auburn Shocks for 1931-33 do not have any part number, Just "DELCO" made in dayton. Right front shock is all cleaned up. 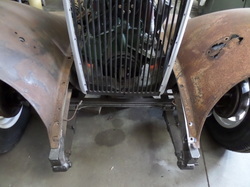 I just need to add the bushing before I install on the frame. 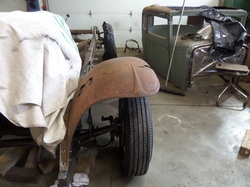 Body waiting to go on the frame.